Richard Attenborough was a lord, an Oscar-winning director for the much-lauded "Gandhi" and an unflagging pillar to British cinema. But Attenborough, who died Sunday at 90, was best known as Dickie. Baby-faced as a young actor and whitely bearded in his older age, Attenborough -- warmly known as "Dickie Darling" -- presided over six decades of British moviemaking as both an actor and filmmaker with a genial warmth that endeared him to his fans and fellow actors. "I have no great interest in being remembered as a great creative filmmaker," he told The New York Times when "Gandhi" was released in 1982. "I want to be remembered as a storyteller." The actor's son, Michael Attenborough, told the BBC that his father died Sunday. He had been in poor health for some time. According to the BBC, Attenborough had been in a wheelchair since falling down stairs six years ago. He spent the last few years in a nursing home with his wife. Prime Minister David Cameron issued a statement calling Attenborough "one of the greats of cinema": "His acting in 'Brighton Rock' was brilliant, his directing of 'Gandhi' was stunning," Cameron said. Ben Kingsley, who shot to stardom for his performance as Mahatma Gandhi, recalled Attenborough's passionate 20-year struggle to bring Gandhi's story to the big screen. The film won eight Oscars, including best picture (over "E.T. "), best director for Attenborough and best actor for Kingsley. "He placed in me an absolute trust and in turn I placed an absolute trust in him and grew to love him," said Kingsley. "I along with millions of others whom he touched through his life and work will miss him dearly." A product of the Royal Academy of Dramatic Art, Attenborough made his screen debut in the patriotic 1942 World War II film "In Which We Serve." He served, too, in the Royal Air Force, and afterward became one of the best-known actors of post-War Britain. He transitioned into directing beginning with 1969's World War I musical comedy "Oh! What a Lovely War." He directed 12 films altogether, including "A Bridge Too Far," "A Chorus Line," "Cry Freedom," "Chaplin" and "Shadowlands." Attenborough was a constant advocate for the British film industry as well as other humanitarian causes, including his extensive work as a goodwill ambassador for UNICEF. He was awarded the Martin Luther King Jr. Peace Prize in 1983. He was knighted in 1976, and 17 years later received a life peerage, becoming Baron Attenborough of Richmond upon Thames. "Dickie Attenborough was passionate about everything in his life -- family, friends, country and career," said Steven Spielberg, director of "Jurassic Park." "He made a gift to the world with his emotional epic 'Gandhi' and he was the perfect ringmaster to bring the dinosaurs back to life as John Hammond in 'Jurassic Park.' He was a dear friend and I am standing in an endless line of those who completely adored him." The son of a university principal, Attenborough was born Aug. 29, 1923, into a family with strong liberal views and a tradition of volunteer work for humanitarian concerns. One of his younger brothers is naturalist David Attenborough, whose nature documentaries have reached audiences around the world. A small, energetic man with a round face that remained boyish even in old age, he was perfectly cast at the start of his career as the young sailor or airman of British movies during and after World War II. In his 1942 film debut as a terrified warship's crewman in "In Which We Serve," a 19-year-old Attenborough made a small part into one of the most memorable roles in the movie, which won the Best Picture Oscar. In 1947, Attenborough gave one of the best performances of his career as the teenage thug Pinkie in "Brighton Rock," the film version of Graham Greene's novel. His youthful appearance nearly cost him the lead role in the original cast of "The Mousetrap," because its author, Agatha Christie, didn't think he looked like a police detective. But he starred with his wife, actress Sheila Sim, when the hit play opened in November 1952 and stayed for 700 performances. In 1959, Attenborough joined fellow actor Bryan Forbes in film production. "The Angry Silence" in 1960 was their successful debut, with Attenborough playing a strike-breaking factory worker. It was one of the first of the gritty, working-class films that heralded Britain's "new realism" of the 1960s. Together, Forbes and Attenborough produced "Whistle Down the Wind" in 1961 and "The L-Shaped Room" in 1962. Their last film, 1964's "Seance on a Wet Afternoon," won Attenborough Best Actor awards from the London Film Critics and British Film Academy. In the meantime, he had appeared as a prisoner of war in 1963's "The Great Escape" - known for its classic ensemble cast, including Steve McQueen, James Coburn and Charles Bronson - and starred in "Guns at Batasi," for which he won another British Film Academy award. In 1967, he won a Golden Globe for Best Supporting Actor in "The Sand Pebbles." In 1969, Attenborough turned to directing with "Oh What a Lovely War," a lampoon of World War I, which won a Golden Globe award as best English-language foreign film. Three years later, he made "Young Winston," the story of Winston Churchill's early life. In between, in 1971, he turned in a chilling performance as 1950s mass murderer John Reginald Christie in "10 Rillington Place." His return to directing in the 1977 war movie "A Bridge Too Far" was an expensive disaster, despite its cast of international stars. The following year, the heavy-handed 1978 thriller "Magic" with Anthony Hopkins, also fared poorly. "A Chorus Line," Attenborough's 1985 film of the long-running stage musical, also took a critical beating. And, more recently, 1996's "In Love and War," failed to win much critical support. Attenborough was often thought to be at his best when trying to coax the finest work from actors. "Gandhi" made a star of its little-known leading man, Kingsley, and Denzel Washington won an Oscar nomination for 1987's "Cry Freedom." "The people I want to reach are those who have never even considered the whole question of South Africa. In order to do that, you have to make a film that is fundamentally entertaining. I'm in the entertainment business; I'm not a politician," he told The Associated Press at the time. "I make movies for millions of people all over the world." Debra Winger was nominated for an Oscar and Anthony Hopkins gave one of his best performances in "Shadowlands," a small, subtle film that won Attenborough perhaps his greatest critical praise. Attenborough's later years were marked by a personal tragedy when he lost his daughter Jane and granddaughter in the tsunami that hit Thailand the day after Christmas in 2004. The heart-broken Attenborough said he was never able to celebrate the Christmas holidays after that. He is survived by his wife, Sheila Sim, their son and a daughter. The family is expected to make a full statement on Monday. RIP Sir Richard Attenborough. GANDHI was masterful. 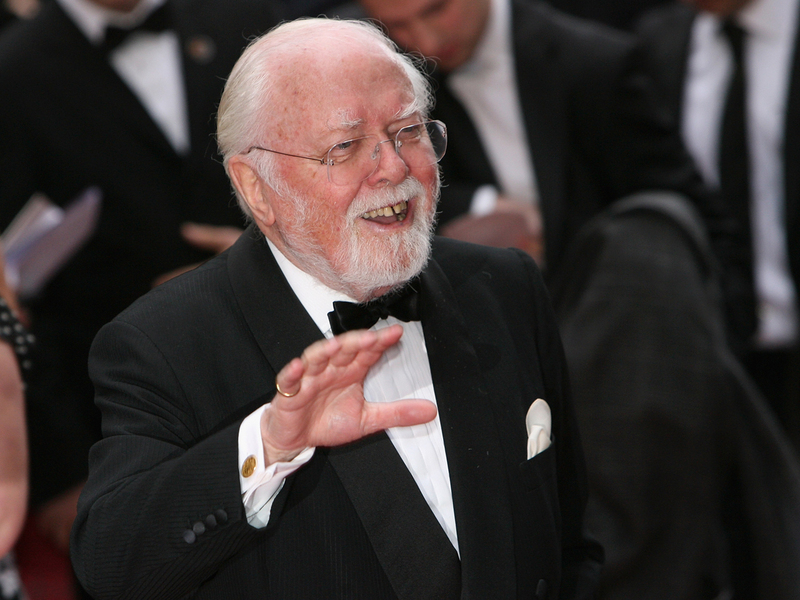 RIP Richard Attenborough. One of the true greats of the silver screen. “@mallard1971: Richard Attenborough has left us- 90 pic.twitter.com/NjxICBcLOI” I had the pleasure of working with him. An absolute gentleman! Very sorry to hear of Richard Attenborough's passing.